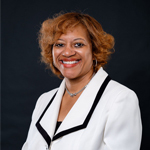 This month Dr. Nadine Wheat is recognized. Dr. Wheat is the new Director, Master of Science in Organizational Leadership (MSOL) and Undergraduate Business Programs. Learn more about her in the Q&A below. A. Teaching, I love it when a student gets it! Since I have a passion for learning and I consider myself a lifelong learner, I thoroughly enjoy facilitating the learning process of the adult student. A. I was attracted to Union for many reasons, to name a few the one-to-one attention given to the students, putting the student first, the fact that Union values the connection of social justice for its community and that Union has been around for over 50 years and has been successful. Q. If you could have any job in the whole world, what would it be? attracted you to become a part of the Union family? A. I think that fact that I am so well versed but I am very down to earth. I am very easy to talk to about anything and I do my best to make everyone feel comfortable. A. Wow, this is a tough one. I love to read and I read many different genres of books. To narrow it down to a favorite is kind of hard, but three actually come to mind however the first one is God is in Control by Charles Stanley. This book relates to life overall and is a reminder that God is in everything nothing is excluded, there is a plan. Sun Stand Still by Steven Furtick is a book that helped me face insecurities, fears and allowed me to realize my potential and purpose. The third is Who Moved My Cheese by Spencer Johnson, MD this book is great for dealing with change which is inevitable.